The new Tejas Express is creating quite the headlines nationwide, with its special features and novel factors. However, even before its maiden voyage, some unidentified miscreants have damaged the Indian Railway’s new venture. The windows of the train that were made of glass were found damaged as if someone had thrown a sharp object on it. This incident has happened only a day before Tejas Express begins its first run from Mumbai to Goa, some miscreants have damaged the windows of this premium train. 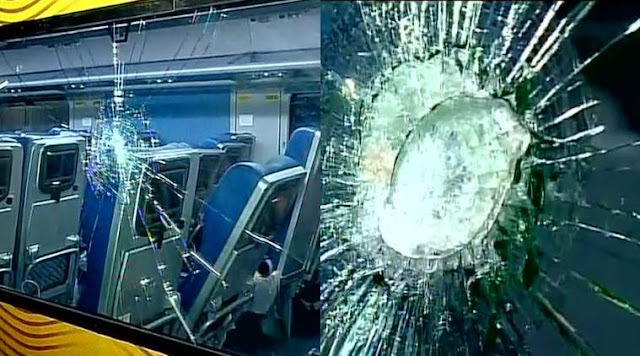 The glass windows were found cracked after the train arrived from Delhi to Mumbai. This was reported by news agency ANI on Sunday. The train which is equipped with latest designs and technology is to be flagged off by the Railway Minister Suresh Prabhu on Monday from Chhatrapati Shivaji Terminus (CST).